Now patients who are missing teeth have a strong, beautiful alternative to bridges, partials, or full dentures. Dental implants will improve your smile and your lifestyle. They look, feel, and function like natural teeth because of the titanium posts that, when placed in the jawbone, fuse with bone tissue to create a strong foundation for a prosthetic tooth. 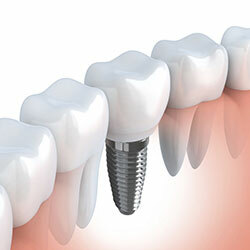 Dental implants can also anchor bridges, partials, or dentures to eliminate slipping. After a thorough evaluation, we can tell you whether you’re a candidate for dental implants. They require adequate bone structure for placement. The first stage of the procedure involves oral surgery in which a titanium post is implanted into the jawbone for each missing tooth or for the new teeth that will anchor a bridge or denture. We practice interdisciplinary dentistry with all facets of dentistry, but particularly with implants. Therefore, we partner with trusted oral surgeons and periodontists to safely and effectively perform the procedure in which the implants are placed into the jawbone. By working closely with these specialists, we orchestrate the process, so you can feel confident in your care. Having a like-minded team that understands your condition ensures that all factors that impact the implant process are addressed and dealt with. World class laboratory technicians will then handcraft your restorations and we will meticulously fit them to your dental implants in our office. So, from start to finish, we will be right by your side, overseeing your dental care and giving you the peace of mind you deserve. By imitating a natural tooth from the root up, dental implants offer a prosthetic that closely mimics nature. The result? Dental implant patients enjoy restored function, which allows a healthy diet of hard-to-chew foods. Speech may also improve. Strong and secure, your new smile will boost your confidence, enhance your appearance, and improve your quality of life.